Our pups deserve their own comfy spot in the house, and a crate is a great way to give them that. Sometimes, though, having a pet crate in the middle of the living room looks a bit odd. Fear not, decor-conscious dog owners! Here you will find the best dog crate furniture that will serve the dual purpose of looking stylish, and housing your pooch. Dog crates come in many forms – plastic dog crates, wire cages, folding metal dog crates, and soft crates. Types of dog crates used generally depend on the needs of the pet. Dog crate furniture is the ultimate co-habitation of a pup and human – comfy, safe, and pretty all at the same time. If your pet is crate trained and you’re contemplating making the shift from normal old crate to furniture crate, then check out the best dog crate furniture on the market. This beautiful MDF wood end table is superbly constructed and finished with metal accents, and brings a rustic look to any room of the house. Customers have praised the quality of materials and construction, making this one of the more solid, durable furniture crates that we reviewed. It seems to be available in only one size currently, which is medium. Larger dog breeds may have some trouble getting in and out, but it is advisable to measure your dog before deciding if they would fit. Here’s a handy guide on how to do this. The Boomer and George table makes a stylish addition to any room, and serves its purpose well as a dog space. Despite the solid design and metal finishings it can still be chewed by determined pups, so be careful! Available in 2 finishes and 2 sizes, this sleek, simple design can only add to the decor. Made from sustainable rubberwood, this pet product is dense and sold, as well as being more eco-friendly than others. In addition to the striking wood, the melamine-covered, waterproof MDF floor makes it easy to clean and keeps odors away. The vents offer your pup a 360-degree view and a well-ventilated space even when closed in. The larger of the two caters for pets up to 80 pounds, and a small, stylish, stainless steel latch keeps your pet inside if needed. There is also a clear plastic sheet attached to the inside of the door, to protect it from chewing, although it is up to you whether or not you use this. Your pup may feel too boxed in with it on the door and panic when inside. For an affordable and perfectly adequate furniture crate, you can’t go wrong with the Casual Home. While they may not be the most super sturdy of all, they serve their purpose very well – a dog home that doubles as a table. You can take your pick of finishes, and they are available in various sizes and designs as well. Dogs up to 90 pounds will fit in a Casual Home comfortably, but if you have a puppy, be warned – they may chew through it! For a functional crate that fits in with home decor (and doesn’t break the bank), the Casual Home Wooden Pet Crate is a great option. 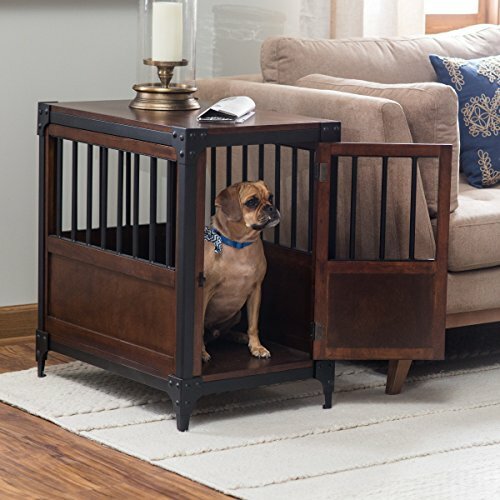 The beauty of this little dog crate table is that it doubles up as a gate, or more specifically, a barricade with a gate. As you can imagine, this is super useful especially when you have dogs in the house and you may need to keep them in a particular area for a bit. It’s stylish too, with a solid wood veneer and black metal bars. This piece of furniture takes furniture crates to another level, and is a must-have for pet owners whose pups need a set-apart area. The openness of it also makes it comfy for pets who don’t like being closed in, so this is a fantastic, versatile option! The top panel is not attached to the sides – if you have a large breed dog who may bump (or intentionally push) it off, beware! According to their website, ZenCrate is not just a product, it’s a solution. ZenCrate has created a great anti-anxiety pet crate here. They pride themselves on being a homeopathic solution for separation anxiety and fear of loud noises, and this crate delivers. This smart crate uses a motion sensor to detect when your dog is in the crate, and begins playing soothing music. The design also makes it fairly soundproof, so outside noises shouldn’t interfere. It also incorporates vibration damping tech, which helps reduce the effects of thunder. There is also a motion-activated fan, an orthopedic foam mattress, the door is removable, and you can get a Wi-Fi camera installed as an add-on, just to make sure your pooch is okay at all times. This is more of a dog box than a crate, but for pups who need that comfort and safe space it’s a stylish way for them to feel safe. While it may sound awesome to have your dog sleeping in your end table, you need to put some thought into whether or not this is going to work for you (and them). Not all dogs will be crate trainalble, but most can be trained to get used to being in one. Many dogs will grow to love their own little space and will go there when they feel they need to cool off or relax. If you are keen on the idea of kennel furniture, it would be advisable to train your pup first, so that they are comfortable and at home in their little space. You can find an overview on crate training your dog here, and start doing it yourself! Typically, the design is geared more towards small dogs, although medium dogs shouldn’t have a problem either. Larger dogs may have some trouble. Measure your dog and make sure they will fit and have enough space to turn around comfortably because if they are uncomfortable this won’t work! Wooden crates will unfortunately be subject to chewing. The furniture we have reviewed is varied in their construction material – from pine, to cedar, to rubberwood. Most woods will be safe for pups, but if this is something you are concerned about it is worth doing some more in-depth research. Another thing to be aware of is the coating on the wood. If you have a sensitive dog, the paint or stain could aggravate their allergies. Again, read the reviews and decide for yourself! Most of these crates don’t come with any kind of mats or pads or pillows to keep your pet comfy. They are simply the outer shell, and it is up to you to kit out the den for your pup. lenty of accessories can be placed in a crate to make it comfier and more pleasant for your pup. These include dog crate trays (this makes it easier to clean), bedding, and things like water and food bowls. It is THEIR space, so you may want to get them a toy or two to keep in there specifically too. It is also advisable to put a good bit of thought into it before choosing an end table type crate. They can bring up some issues, and if you spend the cash and then it doesn’t work out, you could feel rather despondent. Is This Type Of Crate Suitable For Any Dog? These furniture type crates may not be suited to every dog, because different dogs have different temperaments. As the owner, you will have the best idea of whether or not your dog will deal well with this kind of space. For dogs who like to chew, this may not be the best option. Despite being decent quality, tenacious chewing will more than likely damage the furniture. Also, most of these are designed for smaller dogs and large pups might not fit. Why Get Dog Kennel Furniture? If your pup chews on everything! If you want to travel with the crate – a heavy-duty dog crate will work better for this purpose! Of course, having the above issues doesn’t mean you can’t get a kennel crate. They are definitely worth getting, because even if your pup can’t use it now, they may use it in the future. Anyway, with such stylish pieces available, you don’t even need a dog to buy one! What exactly is dog crate furniture? Contrary to popular belief, it is not furniture for your dog to furnish their crate with. 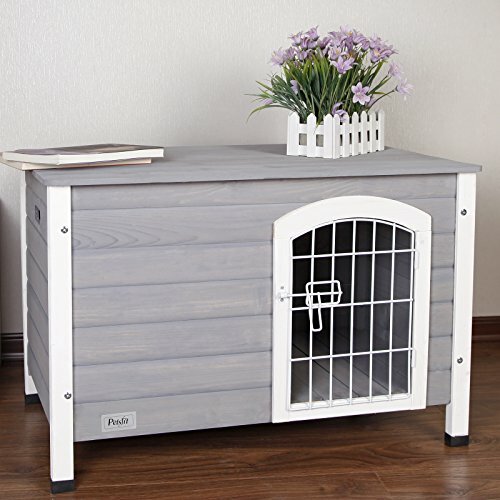 Basically, this is a dog crate that is designed to look like a nice piece of furniture. This is great because it can fit into the home decor without being conspicuous. MDF stands for medium density fiberboard. It is made by breaking wood down into fibers, mixing it with a resin binder, and pressing it into panels in a high temperature, high pressure environment. 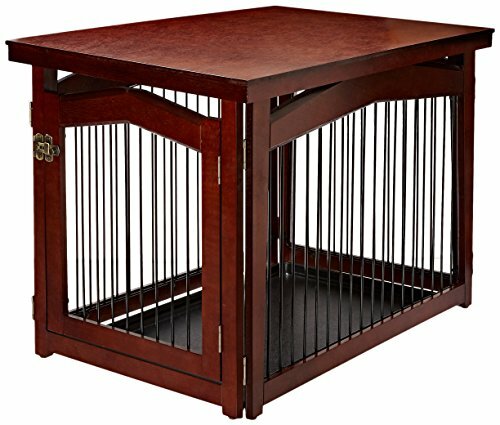 Can I use a furniture crate for training my dog? You probably could, but it is not advisable. A wire cage is recommended to begin training, as it is open and easy for your pup to see out of. Wire crates are also the best option to train with because they come with a divider, which is a useful training tool. Inner size of the room:28"Lx18"Wx16"H,more details,please refer to the 2nd photo. If you’re looking for something that can be used more as sideboard than an end table, then this one is for you. The shape also allows your pup to have the option of lying so they can see through the door, or around the corner in a little cave. This one is as pretty as it is functional, and easy to set up. It’s also coated in non-toxic paint, so your furry friend is safe in that sense too. It suits pets up to 30 pounds, and they do have a raw wood design with an openable top if you would prefer something less colorful. Can get hot inside – make sure your pet is comfy! 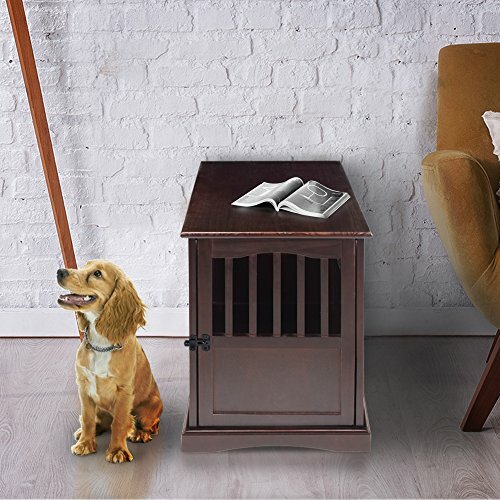 This adorable piece of dog furniture may not be as practical as a dog crate end table, but your pup will love having their own playground. With an enclosed room area on the bottom and a puppy patio on the top, your pooch will have a choice of where they feel like sitting. This little home is made from cedar wood and treated with a natural dye stain and is intended for small dogs. 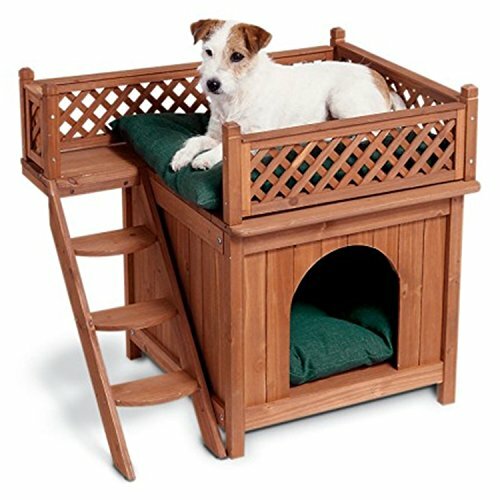 Easy to put together, and with removable top and bottom panels for easy cleaning, this is one super cute pup house. If you have two small dogs and want something to accommodate them both, this is the perfect thing, because it fulfills the dual purposes of being functional and adorable. This easy to assemble, a double doggy bed is the cutest way to keep both your pups comfy and cozy. The raw wood design means you can stain it or paint it as you wish, and you will need to add the beds yourself. It is designed for small dogs (under 15 pounds) and would be perfect for a puppy’s first bed. Be aware of your pup’s temperament with this one, because dogs who are boisterous or overly tentative may have some problems with the stairs! Crate training your dog is recommended for many reasons, like traveling, taking them to the vet, or simply getting them used to having a safe, enclosed space they can go. 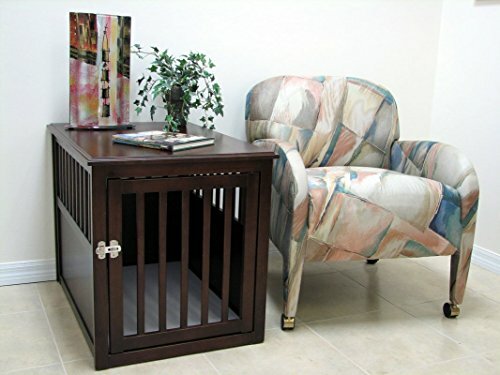 Once your pup is trained, dog crate furniture is the best way to provide them their little comfy spot and have a beautiful piece of furniture around at the same time. These are super popular because they are the overlap of human and pup in one space. Never before have our pups felt more like family! If you like this idea, do your research on what would be best for your pooch. 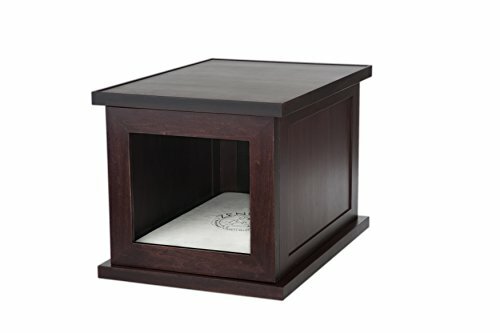 Are there other pieces of kennel furniture you use that are worth a mention? Let us know in the comments!